I have long been an admirer of Jez Alborough. He’s not the kind of illustrator who wins prizes, but he’s been producing bright, attractive, funny and warm books just right for young children and their carers for a couple of decades now. This one isn’t perhaps as good as the Eddy and the Bear books or Duck in the Truck, but it’s well up to his usual standard. 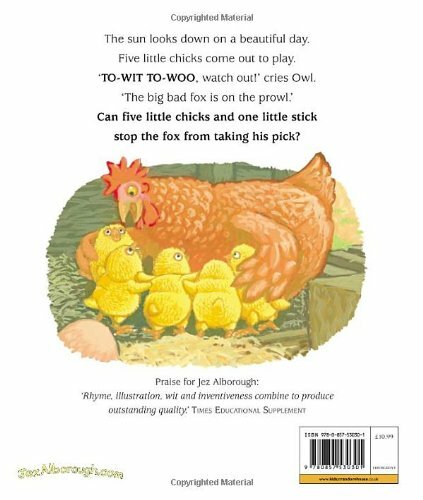 Told in jolting verse, it’s the story of hen and her five little chicks, who are warned early on of the coming of the ‘hairy, scary, big bad fox’, and with the help of luck, the goose and the owl, manage to thwart his eventual attack. The five little chicks who begin the book (a sixth is born after the fox’s retreat) are individually characterised through their habitual actions: going ‘hop, hop, hop’, ‘peck, peck, peck, peck’ or ‘flap, flap, flap’; actions which feature both in their play in the yard and in their panic when the fox pushes his ‘long pointy snout and his big toothy grin’ into a hole in the hen house. The chick who goes ‘kick, kick, kick’ with a stick fortuitously proves the fox’s downfall. The pictures are, as ever, exuberant and colourful with the usual mix of comedy, anticipation and drama: the fox’s voice being heard long before we see his face. Once more, it’s a pleasure to share.